The vibrancy of this curry lies in the bright sourness of tamarind and the fragrant hit of fresh curry leaves, so both are worth seeking out. Preheat oven to 180C and line a roasting tray with baking paper. 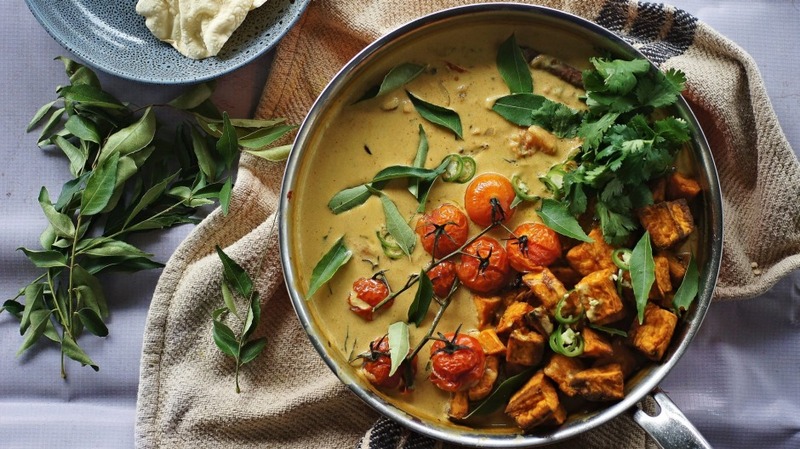 Toss sweet potato pieces, ½ tbsp coconut oil and turmeric in a bowl until coated. Pour onto prepared tray and roast until golden (about 45 minutes). When 15 minutes remain, add the cherry tomatoes to the tray. Remove from oven and set aside. Heat remaining tablespoon of coconut oil in a large saucepan over medium-high heat, add the crushed spices, cinnamon stick and curry leaves, and stir until spices pop (1 minute). Add onion, garlic and green chilli and cook until tender, stirring occasionally (4 to 5 minutes). Stir in the dried chilli flakes and ground coriander, and once fragrant, add chopped tomatoes and cook until they begin to break down (2 to 3 minutes). Add the softened tamarind and 700ml water or vegetable stock, and simmer for 8 to 10 minutes. Add the coconut milk and simmer for a further 4 to 5 minutes, before adding the roasted sweet potato and tomatoes. Serve with rice and garnishes of your choice. Note: the roasted sweet potato and tomatoes should warm through in the curry, but if you prefer, you can add them earlier while it's still on the stovetop.